DES MOINES, Iowa, September 22, 2015 (ENS) – Democratic U.S. presidential hopeful Hillary Clinton today told a town hall meeting that she opposes the TransCanada Keystone XL oil sands pipeline. 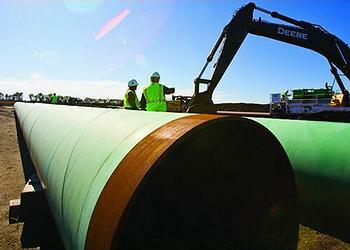 Keystone XL is a proposed 1,179-mile (1,897 km), 36-inch-diameter, 830,000 barrel-per-day crude oil pipeline. It would begin in Hardisty, Alberta and run south to Steele City, Nebraska, where it would link to existing pipelines that move oil to refineries on the Gulf Coast. “Time to invest in a clean energy future – not build a pipeline to carry our continent’s dirtiest fuel across the US. I oppose Keystone X,” Clinton tweeted later today. Clinton says she will put out a clean energy plan within next few days, before the Democratic debate on October 13, the first of this campaign. Keystone XL critics say it would increase greenhouse gas emissions by enabling further development of Canada’s oil sands, which yield heavy bitumen, called the dirtiest oil in the world. They fear burning tar sands oil would boost the planetary temperature out of control. Pipeline supporters say Canadian tar sands oil would bolster North American energy security and provide thousands of construction jobs while the line is being built. 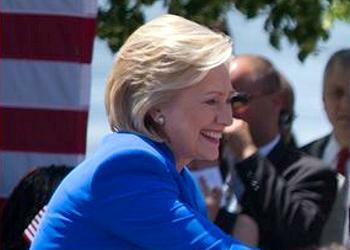 In 2010, while serving as secretary of state, Clinton said she was leaning toward approval of the pipeline to move tar sands oil across the Canada-U.S. border. To cross that border the pipeline needs a Presidential Permit that determines it is in the U.S. national interest. The Obama Administration has been considering the matter for more than seven years. In January 2014, the State Department completed a final supplementary environmental impact statement after the first EIS was challenged for inaccuracies and a suspiciously close association between the authoring corporation and TransCanada. In view of these delays, TransCanada chose to proceed with the southern portion of its Keystone expansion as a separate project, the Gulf Coast Pipeline Project. Because it does not cross a border, no Presidential Permit was needed, and that part of the pipeline is now complete. Senator Bernie Sanders, who is running against Clinton for the Democratic presidential nomination, opposes the Keystone XL pipeline. He has urged her to state her position. Activists say Clinton’s announcement paves the way for President Barack Obama to reject the Keystone XL Presidential Permit application. “Today’s news is a huge win for our movement, and ups the pressure even more on President Obama to reject the Keystone pipeline once and for all,” said May Boeve, executive director of the nonprofit climate group 350 Action. If President Obama does approve Keystone XL, TransCanada says the pipeline has a projected in-service date of approximately two years after the issuance of a Presidential Permit.